Away in a manger, asleep on the hay, Meg Langslow finds a little gift. It’s Christmastime in Caerphilly and Meg, full of holiday spirit, is helping out with the town's festivities. While directing a nativity pageant and herding the children participating in it, she finds a surprise in the manger: a live baby. A note from the mother, attached to the baby girl’s clothes, says that it’s time for her father to take care of her—and implicates Meg’s brother, Rob, as the father. And while a DNA test can reveal whether there's any truth to the accusation, Rob's afraid the mere suspicion could derail his plan to propose to the woman he loves. Meg quickly realizes it's up to her to find the baby's real identity. She soon discovers that the baby—named Lark according to the fateful note—may be connected to something much bigger. Something that eventually puts a growing number of Meg’s friends and family in danger. And before long, Meg realizes she can’t fix things single-handedly. Meanwhile, a war is brewing between Caerphilly and its arch-rival Clay County—and it's not a snowball fight. Can Meg bring everyone together in time for the holidays? 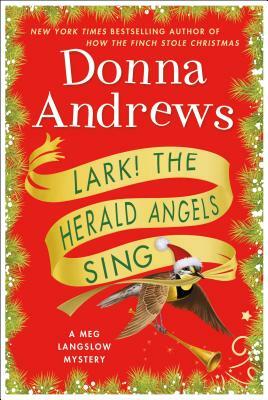 "Andrews manages her large cast with dexterity and drops clues to the culprits’ identity, but the ending will catch most readers by surprise." —Publishers Weekly on How the Finch Stole Christmas! "[A] satisfying, humorous entry in the long-running series." —Booklist on How the Finch Stole Christmas!